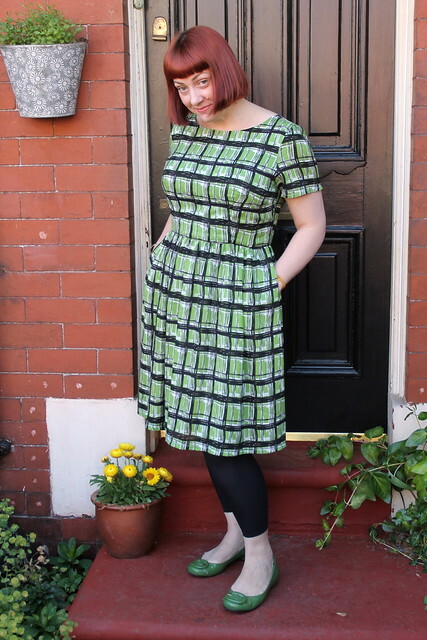 I do love this pattern! This is my third Emery dress, and I don't think for one minute it will be my last. I cut this out several weeks ago, but too busy with other projects and commissions I only got the chance to stitch it up on Saturday. I spent a lovely day in my shed listening to the rain on the roof and stitching away. Honestly, I'm a little disappointed with my lack of pattern matching, actually it's pretty good on one side, but off on the other. My own fault for cutting out a very slippy light cotton lawn in two layers, I really should have cut it out singly to be sure. I can live with it though. The fabric is from Abakhan in Manchester. I am very lucky to have my friend Mary working there, she knows my tastes and if she sees something she thinks I will like she gives me a shout. She got this one spot on! Thank you Mary! PS: yes my roots need doing, job for later today!! Thank you, and yes I am lucky! Lovely dress. 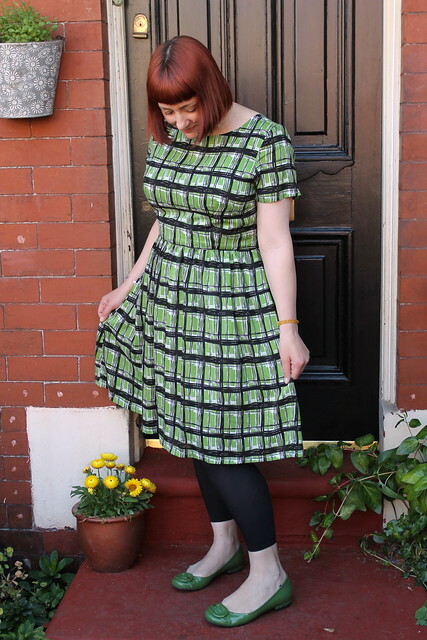 I made a dress too last week! That and two a line lined skirts and a simple shift dress! Wow San, you've been super busy! LOL, sat here now with dye on! And I'm very glad you do! What a lovely Emery, the fabric is fabulous, really love the colour! What a lovely dress! Great fabric choice! Me Made May is all done! Me Made May '14 Week Two!